Seafood recipes like Grilled Marinated Shrimp Recipe are always tempting, no matter whatever occasion it is. Our tried and tested Grilled Marinated Shrimp Recipe is easy to make that you will leave ordering it at any outside restaurant and you will simply love cooking it at home. · Mix together olive oil, lemon juice, hot sauce, parsley, garlic tomato paste, oregano, salt and black pepper in a bowl while reserving a small amount for basting later. · Now, put the remaining marinade in a large resealable plastic bag with shrimp. Then, seal and marinate it in the refrigerator for 2 hours. 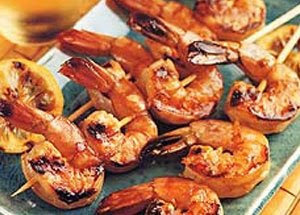 · Preheat the grill at medium-low heat and thread shrimp in skewers piercing once near the head and once near the tail. Discard the marinade. · Now, lightly oil the grill grate and cook the shrimp for about 5 minutes on each side or until it is opaque. Keep basting frequently with the reserved marinade.